The Brief: Take a list of ingredients, a piece of art for inspiration and create something edible and beautiful. This was the challenge set to us by Pick n Pay for Week 8 of the Freshly Blogged challenge. My art knowledge is somewhat pathetic, so I spent most of my friday evening googling famous artists. Feely very uninspired, I went to bed thinking I could do better in the morning. Then at 6am, that time when you moving between sleeping an waking up, a bolt of inspiration hit me. Tim Burton. Not only is he a fantastic director, but his dark illustrations are some of my favourites. With this in mind, I knew I had to create the iconic image from his book and movie “The nightmare before Christmas”. With a bright moon of mashed potatoes, a mountain made of roasted purple cabbage, and sherry chorizo and chicken ‘pumpkins’, my dish was complete. 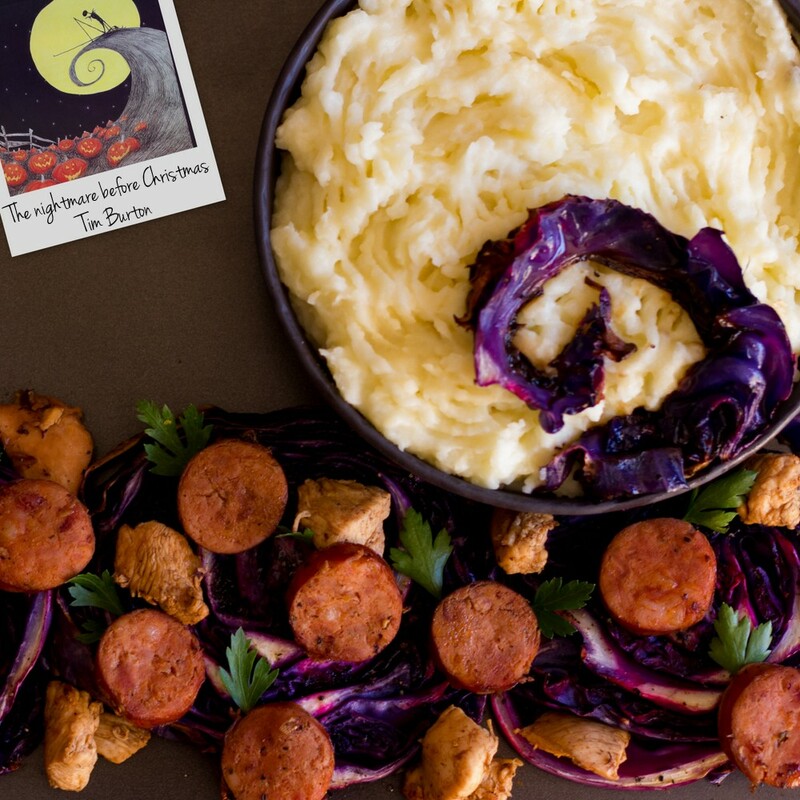 With a bright moon of mashed potatoes, a mountain made of roasted purple cabbage, and sherry chorizo and chicken 'pumpkins'. Slice the cabbage into 1.5cm slices and arrange on a baking tray. Drizzle with olive oil, and sprinkle with salt and pepper. Cut the top off the head of garlic, drizzle with a bit of olive oil, and place on the same baking tray. Roast the cabbage and garlic for 35 minutes until soft. Squeeze the lemon juice on top of the cabbage before serving. Peel and chop the potatoes into eighths, reserving the peels. Place the potatoes in a large pot of water on a medium high heat. Bring to the boil, and boil for 10 to 15 minutes until the potatoes are soft. Drain, and mash with a potato masher. In a separate saucepan, add the potato peels and milk, and heat up the milk just before it starts to boil. Remove the potato skins and add the warm milk to the mashed potatoes. Add the butter to the mash, and mix. Season to taste with salt. In a large frying pan on a medium high heat, add the oil and the onion and fry until soft. Add the chorizo and fry until it starts to crisp up. Add the chicken and fry until browned. Add the sherry, balsamic vinegar and lemon juice. Squeeze the bulbs of the roasted garlic out of their papery skins, and mix with the other ingredients. Cook for a further 3 to 5 minutes until the alcohol has cooked off, and you are left with a tasty sauce. Sprinkle in the flat leaf parsley.